The Chicago Tribune clocked up 22,000 digital signups over the weekend, following the launch of the redesigned website, according to Time Out Chicago’s media blog. Tribune readers are being asked for their zip code and email address ahead of the title starting to charge for some premium content, including opinions and reviews, reports from the watchdog team and content from The Economist. More than 22,000 readers had registered their details between 6pm on Thursday and Sunday morning, according to Time Out. “That is far beyond our wildest dreams, especially with holiday traffic levels,” Bill Adee, vice president of digital media and operations, told Time Out’s Robert Feder. Adee also confirmed that Bloomberg Business News soon would be added as part of the free content on the site. At some point in the future, those who’ve registered will have the option to pay for premium content, including material from the Tribune, the Economist and Forbes. Details of the paywall plan will be determined by feedback from users, Adee said. 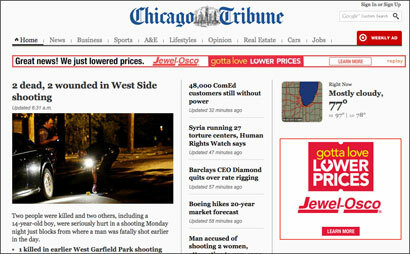 The Tribune’s digital membership page says those who opt to pay will get additional services. We will be creating new apps, special events and e-books and other features that will be included in your digital membership. This entry was posted in Online Journalism, Paid-for content and tagged Chicago Tribune on July 3, 2012 by Sarah Marshall. Writing on the Upshot, John Cook has an interesting investigation into “reverse embedding”, a practice “which permits active-duty service personnel to serve as interns in major media companies – sometimes in an editorial capacity”. The practice is part of the military’s Training With Industry (TWI) programme, which allows military officers to leave the service for up to a year to work for private companies in a wide variety of sectors. But Cook’s article draws attention to the problem with placing officers in media positions, alleging that they may be “gleaning insights and intelligence into how media organisations operate, and perhaps helping to shape the way they cover the military”. Now, however, the program appears to have been reactivated – at CNN and elsewhere. This entry was posted in Investigative journalism, Journalism, Press freedom and ethics and tagged Chicago Tribune, CNN, John Cook, Marines, reverse embedding, The Upshot on August 5, 2010 by Joel Gunter. Do journalists need to learn to code? Probably not, but those who can are likely to find themselves quickly snapped up by news organisations with interactive and data teams. I have no grand hopes of learning to code properly, but I would like to feel a little more comfortable with the language and learn more about the ways programmers work and how it could help journalism. That was one reason I went along to last night’s Ruby in the Pub informal meetup (tagged #RITP or #rubyinthepub on Twitter), initiated by journalists Joanna Geary and James Ball (even though James himself got stuck at work and missed the event). The other reason was to meet brave souls playing in the programming-journalism no-man’s land. I think there are exciting things to come out of the programmer-journalist relationship. We’re already seeing that in projects led by mySociety and OpenlyLocal, in collaboration with bloggers and other media. The US, of course, is streets ahead, with news organisations employing designated journalist-programmers. ProPublica, the non-profit investigative organisation, employs application developers and editors, integrated into the news team, as does the Chicago Tribune (for example). The New York Times has a dedicated interactive team – the head of which, Aron Pilhofer, came along to last night’s meet-up (he recently wrote about this new breed of ‘hacker-journalists’ at this link). Over here, we’re seeing moves in the right direction (the Scott Trust now has a bursary for students who want to learn software development) and of course news organisations do employ developers, designers and programmers, but we’ve got some catching up to do in terms of integrating and prioritising programming skills. So…what is Ruby? Ruby on Rails is a open source web application framework, using the Ruby language. Only a minority of programmers use it (you can see a comparison of frameworks at this Wikipedia link), but it was the consensus language agreed for the meet-up. Developer Dave Goodchild (@buddhamagnet) was restricted by the lack of wifi, but nonetheless he did a grand job in educating us Ruby ignoramuses the very basics. If you do decide to download RoR to have a proper play, Dave recommends building a blog – the format of which is easy to understand for a journalist – and following this online tutorial on the Ruby on Rails blog. It was a brief introduction and the properly keen will have to do their homework to learn properly, but it’s good to hear developers explaining how they use it – and showing how quickly something can be built. The evening was also a meeting of cultures; as journalists explained their various work brick walls and developers explained the differences between various coding languages and platforms. Most useful for me was hearing about the projects developers are implementing in their respective organisations and the tools they are using. Whether or not very much Ruby knowledge was gleaned by the hacks in one evening, I have great hopes for the conversation between programmers and journalists. It could result in some very innovative applications and stories that will help British journalists catch up with our US counterparts and break new ground. If you would like to know more about interactives and data-driven journalism, check out the agenda for news:rewired – the nouveau niche (25-06-10) where these topics will be addressed. Buy your ticket (£80 + VAT) at this link. Speakers include OpenlyLocal’s Chris Taggart; the OnlineJournalismBlog’s Paul Bradshaw; and Ollie Williams from BBC Sport. This entry was posted in Events, Online Journalism, Training and tagged Aron Pilhofer, Chicago Tribune, James Ball, Joanna Geary, propublica on April 28, 2010 by Judith Townend. DocumentCloud, a technology aimed at making data more accessible and helping journalists and news organisations deal with large volumes of documents, has made its debut on the Chicago Tribune’s website. The Tribune has used DocumentCloud to publish the source documents of a news story and allow readers to browse by section and receive additional information around highlighted annotations. Update: Despite this tweet from Aron Pilhofer, I am reliably informed by Amanda Hickman, programme director of DocumentCloud, in the comment below that the technology has also appeared alongside Newshour and Propublica stories too. This entry was posted in Handy tools and technology and tagged Chicago Tribune, Document, documentcloud, Technology/Internet on April 15, 2010 by Laura Oliver. While pre-prepared obituaries are standard practice, it was a little surreal to see an obituary of Michael Foot by Mervyn Jones (d. 23 February 2010) in the print edition of the Guardian on 4 March 2010, the Tribune’s diary notes. An obituary for Jones, who was Michael Foot’s biographer, had appeared in the Guardian on 25 February. The deaths were so close together, the Tribune says, it had to run its own tributes in the same edition. This entry was posted in Editors' pick, Newspapers and tagged Chicago Tribune, Mervyn Jones, Michael Foot, The Guardian, Tribune on March 12, 2010 by Judith Townend. This entry was posted in Journalism Daily and tagged alaska, BBC, blog network, candy box, Chicago Tribune, e-newsletter, Greek Embassy, guardian, head of web, Iraq, john o'sullivan, Journalism Daily, Journalism.co.uk, Met Police, New Statesman, richard herring, senior editor, simon willison, the Journalism Daily, the Tribune, Twitter, United States, University of Alaska, Vestas Journalism.co.uk, Wandsworth Guardian reporter, yemen on July 29, 2009 by Judith Townend. The LA Times and Chicago Tribune are pooling their foreign reporting operations to serve all Tribune newspapers. The operation will be run from Los Angeles. This entry was posted in Editors' pick, Journalism and tagged Chicago Tribune, foreign reporting, LA Times, Los Angeles, the LA Times, Tribune, us on March 26, 2009 by Laura Oliver. Jon Margolis, the former chief political reporter for the Chicago Tribune discusses what he did when ‘real news didn’t come to him’ anymore. He launched an online journal – vermontnewsguy.com. This is either a ‘How To’ or ‘How Not To’ account, Margolis writes. “Wait until you finish, then choose the option you think more accurate,” he suggests. This entry was posted in Editors' pick, Online Journalism and tagged Chicago Tribune, chief political reporter, jon margolis, online journal, The Chicago Tribune, vermontnewsguy.com on February 25, 2009 by Judith Townend.